From a top Military Times ranking to a significant award from the Council of College and Military Educators, UNCW’s commitment to quality educational programs for military-affiliated students continues to earn national recognition. The university has been ranked 1st in North Carolina and 40th nationally on a list compiled by Military Times of the top four-year colleges for military-affiliated students. In the national ranking, UNCW moved up 18 places, from 58th in 2017, and moved up from 3rd in North Carolina. 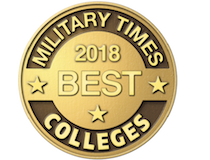 The publication’s “Military Times Best: Colleges 2018” includes both public and private institutions. In addition, UNCW has been selected by the Council of College and Military Educators to receive the 2018 Institution Award for the university’s “dedication, leadership and numerous accomplishments in providing quality voluntary off-duty education programs,” according to CCME. The award will be presented in March 2018 at the organization’s symposium in San Diego, CA. Consistently recognized as a military-friendly university, UNCW was ranked 9th on the 2018 U.S. News & World Report list of “Best Colleges for Veterans in the South,” up two places from the 2017 list. UNCW was founded in 1947 to provide educational opportunities for returning World War II veterans and honors that objective by enhancing academic programs and support services for military-affiliated students. The Onslow County Extension, in partnership with Coastal Carolina Community College, Marine Corps Base Camp Lejeune and Marine Corps Air Station New River, provides veterans, active-duty military and dependents in the Jacksonville, NC, area with convenient access to classes and support services. The Office of Military Affairs collaborates with academic and university departments to assist military-affiliated students. In 2017, the university expanded its Military Resource Lounge, which was funded in part by a grant from the Student Veterans of America and The Home Depot Foundation. Providing accessible and affordable education to students, as well as an inclusive environment that serves the needs of both traditional and nontraditional students, are critical components of UNCW’s Strategic Plan.